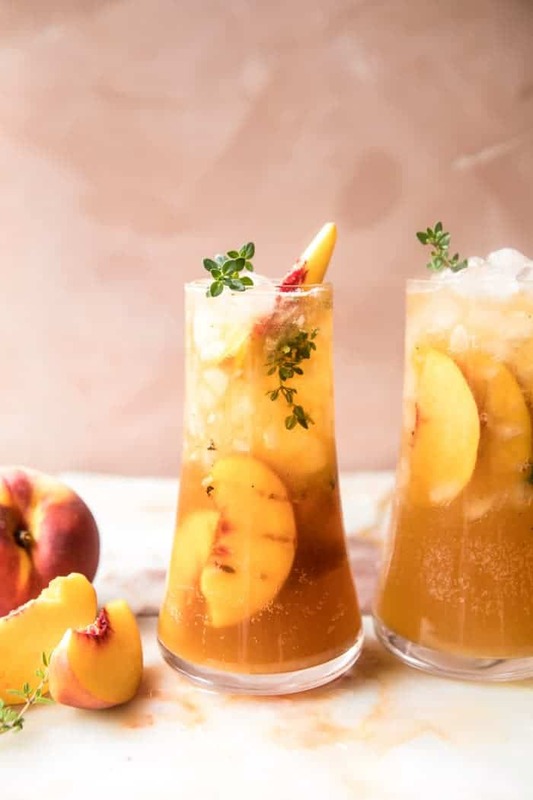 Gingered Peach Bourbon Thyme Smash. Gingered. Peach. Bourbon. Thyme. Smash. I mean, I mean?! Come on, how good does that sound? It feels so southern, right? Loving it! Speaking of feeling southern, guys, I’m in a southern kind of mood. I think it’s the time of year, I am loving all of these beautiful peaches, tomatoes, and corn that seem to be surrounding me. These special fruits and veggies in particular always make me think of southern delicacies (hello to this sandwich, this salad, and these shortcakes)…I’m certainly not complaining though! OKAY! First, happy Saturday to everyone. Glad to be back today for another fun cocktail Saturday post. I’ve had this drink in my back pocket for quite a while now, so I’m pretty excited to be sharing it with you guys today. This feels like late summer in a cocktail glass. 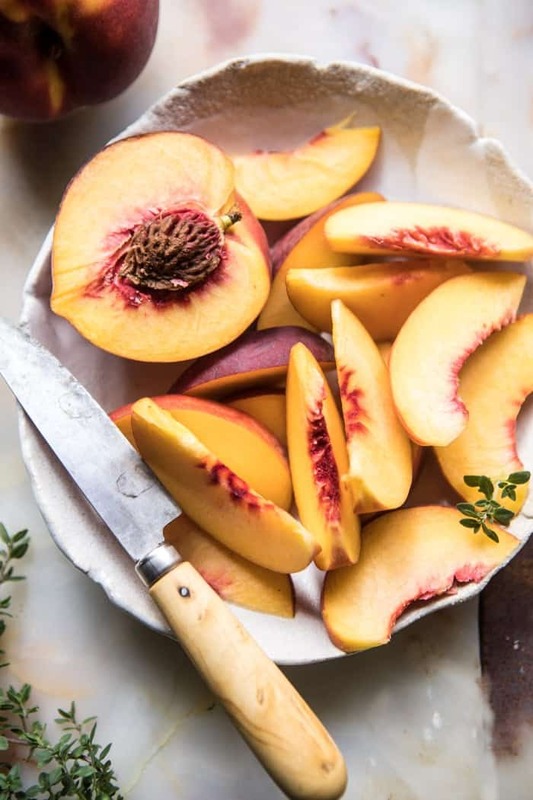 The peaches are the perfect ripeness during these mid August days and I’m trying my hardest to incorporate peaches into pretty much everything…ok I don’t really need to try very hard, using peaches in everything is a pretty easy task for me. Anyway, this fun peachy bourbon drink is my new obsession. 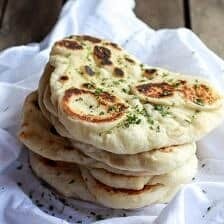 I’ve been making them weekly on Friday nights for friends and family and everyone loves them. Like LOVES them. 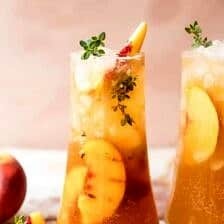 These drinks are slightly sweet, hinted just lightly with thyme, and kicked up with a little ginger and fizz action from my favorite drink topper, ginger beer. 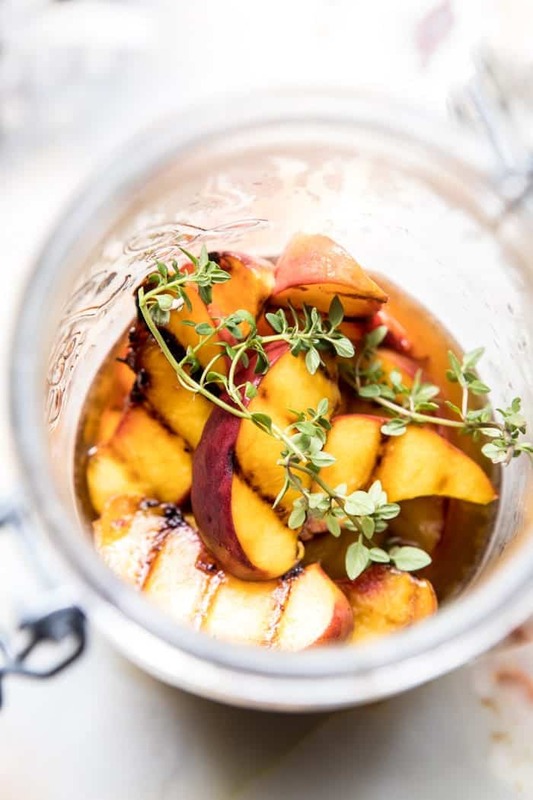 –> muddle fresh peaches with some thyme, honey, and lemon juice. –> add a splash…(or two) of bourbon. 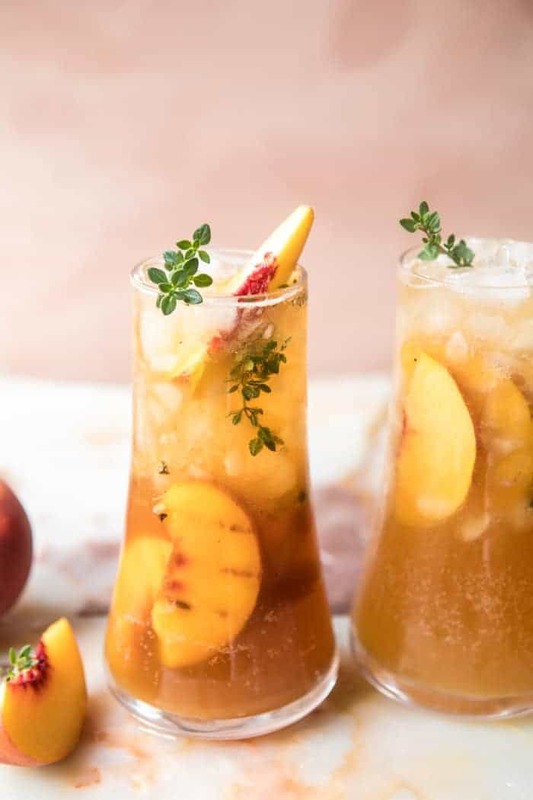 –> fill your glass with ice and then add that muddled peachy goodness. –> top with ginger beer. Hope you’re all having a great Saturday! 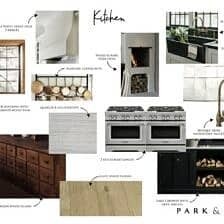 See you back here tomorrow for a Nine Favorite Things post. 1. Heat a grill or grill pan to high and grill the peach slices for 2-3 minutes per side. 2. 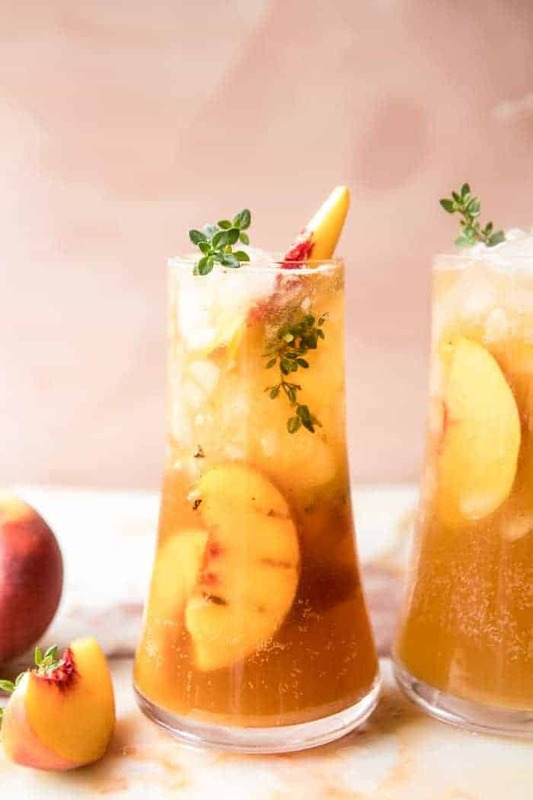 In a cocktail shaker or glass jar, add the peach slices, thyme, lemon juice and honey, using a muddler, muddle all of the ingredients together, squishing everything to release the juices. Add the bourbon and shake to combine. Peach bourbon smashes for all! 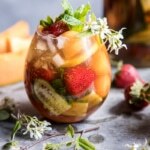 Strawberry Peach Sweet Tea Julep Pitcher. 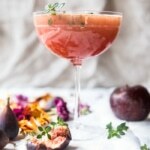 Fig Honey Thyme Prosecco Smash. 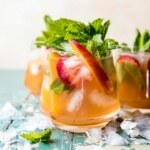 Strawberry Melon Elderflower Pimms Cup. 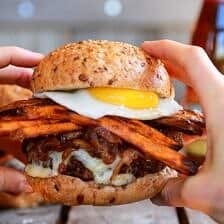 This looks soo amazing. And I love that you incorporated peaches! Whenever I notice fresh thyme gently added to any food or drink, I’m into it; one of the best herbs, ever ! Thank you ! It is a great herb! Thank you & I hope you enjoy! 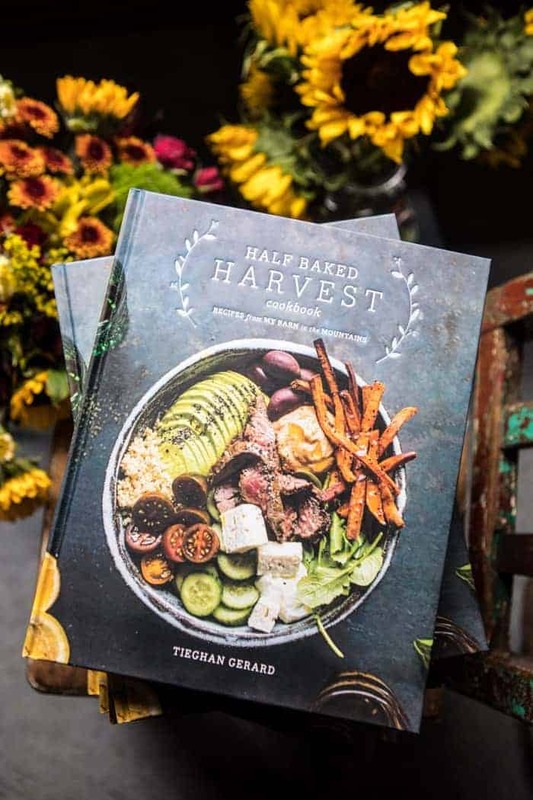 Whaahoo 1 month until your cookbook is released–can’t wait to see it and use it. You, too? Smiling and waiting. I am SO excited for you guys to see it! & I am so happy you are to! Haha so glad you’re loving this! Are your peaches grilled first? Just noticing in the photos…. drink looks mighty tasty!! Yes they are! Thank you so much for pointing that out. 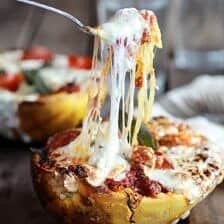 Recipe has been fixed! 🙂 Hope you love the drink! Thank you Laura! Hope you love this! Fun one…did put in all the peach muddle into the drink to really get the peachness. Neat combo…and thyme is such a great fresh herb..keep up the good work in showcasing the fresh herbs – so easy to grow and have right available. Thanks mucho for this fun cocktail! 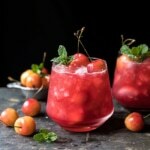 Made this drink over the weekend and it was a hit! It’s the perfect blend of all the flavors- peaches, ginger, lemon & thyme. 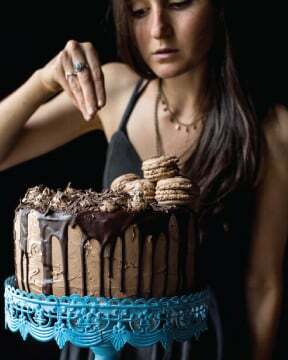 I used Black Feather bourbon whiskey and it was so good! I am so glad you loved this drink Hannah! Thank you!